Packed with anti-aging and antioxidant properties, Heal has been formulated to maintain skin's elasticity, reduce the appearance of stretch marks, reduce inflammation, treat eczema and psoriasis and protect skin cells from damaging free radicals. Skin feels moist, supple and exceptionally comfortable. Reduces the appearance of wrinkles and stretch marks. Prevents scarring and lightens and heals scars. Assists in the skin's healing process. Protects against damaging free radicals. Massage onto clean skin for a decadent moisturizing experience. 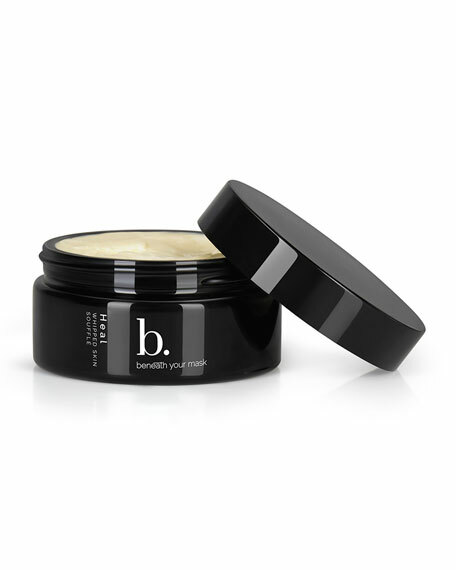 Our whipped skin soufflé is very concentrated so allow a few minutes for it to absorb into skin. Can be used on both face and body. Beneath Your Mask was created as a skin, body, and hair rejuvenation line designed to fight the toxic elements found in everyday life. These handcrafted products are sourced from potent organic and wild-harvested botanicals with restorative properties.